The Picture Exchange Communication System (PECS) is a form of augmentative and alternative communication. It is a picture-based system, based on behavioral principles of learning, which primarily targets the initiation of spontaneous communication, within a social context. The basic premise is that children are taught to exchange a picture representing a desired item or activity. PECS is a widely studied and researched methodology typically for learners with autism. It is comprised of a series of hierarchical phases, which take you from requesting, to answering questions, to commenting on the environment. Phase I teaches a child how to communicate. I give her this picture and I get that toy. The focus is on initiation; there are no verbal demands placed on the child during this phase. The child must spontaneously reach for the picture and place it in the communication partner’s hand. Most important during this stage: use the best stuff first! Bring out the squeezy balls, the spinners, the iPad, and yes, even the oreos. Use what is most desired to achieve the best, and quickest, results. Phase II teaches a child distance. In this stage, the child learns to find his PECS book within the environment, remove the picture, and then find his communication partner to give it to. Make the child work for what he wants. Teach him to be an active participant in order to get stuff. Teach him to pay attention to, and navigate, his environment. Phase III teaches discrimination. The child learns that each picture represents something different and specific. 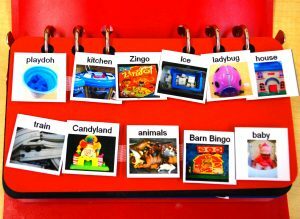 As the child acquires new interests (toys, foods, activities), picture representations of these items are added to the PECS book. The child learns to navigate the book by turning pages and scanning multiple pictures to find the exact one he wants. Phase IV teaches sentence structure. The child uses carrier phrases, such as I want, to create a simple sentence. The next steps can include adding verbs (eat, drink, play, go, etc.) and adjectives (red, big, wet), to create longer sentences. Phase VI teaches commenting. The child uses carrier phrases, such as I see, I hear, It’s a, to communicate a comment, rather than a request. Research studies suggest that, in addition to learning spontaneous communication, children also demonstrated an improvement in social skills, and a reduction in inappropriate behaviors. Studies have also shown that PECS has actually facilitated the development of verbal language, in some children, which negates the myth that it replaces spoken speech.